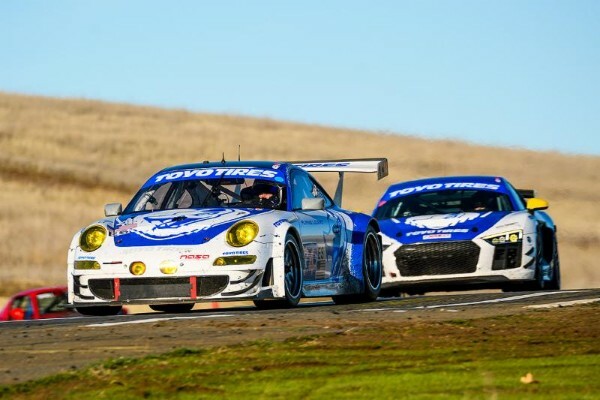 Sunday afternoon at Thunderhill Raceway Park, Flying Lizard Motorsports celebrated its fourth consecutive overall victory at the 25 Hours of Thunderhill, also winning in both classes with a Porsche 911 GT3 RSR and an Audi R8 LMS GT4. Johannes van Overbeek, Justin Marks, Andy Wilzoch, Charlie Hayes, and Wolf Henzler drove the Porsche to victory after assuming the race lead with five hours remaining. While being the only car in the Toyo Tire GT Challenge class, the all-female Audi team of Christina Nielsen, Erin Vogel, Laura Ely, Aurora Straus, and Ashton Harrison raced hard in the competitive field of seven classes, earning an impressive fourth place overall finish. Johannes van Overbeek and Christina Nielsen started from their respective pole positions in the ES and Toyo Tires GT Challenge class. Starting fifth overall, van Overbeek brought the #74 Porsche 911 GT3 RSR to second position in the opening turns and was quickly putting pressure on the overall leader. Trouble struck in lap nine when the left rear axle failed, resulting in the Porsche retreating to the garage for repairs. Van Overbeek rejoined 14 laps down in 43rd position, and climbed up to end his stint in 37th position. Justin Marks took over from 36th, putting in a strong first stint in the packed field to gain 17 spots. Andy Wilzoch continued the climb in his opening run, setting the car up to run 13th, and with Charlie Hayes next at the wheel, the #74 Porsche returned to the top ten. Wolf Henzler opened his stint with impressive lap times, bringing the Porsche into the top three just after sunset. As the shifts rotated through, the No. 74 Porsche got up to second position when another axle issue sent the car back to the garage for repairs. The car rejoined the field eighteen laps down, but still in third place and the team raced through the night to maintain position in the top three. The sun rose over the track at 7:30AM, and with five hours remaining, the race leading #44 One Motorsports Radical pulled into the pits with another issue, losing their lead of eight laps over their sister car and the Flying Lizard Porsche. As the No. 67 One Motorsports car and the Porsche battled for the lead, van Overbeek claimed the top position in lap 596. As van Overbeek continued to lead the field into Sunday morning, continued problems for the No. 44 One Motorsports car dropped the entry further down the list, moving the No. 45 Audi up to fourth overall with three hours remaining. Christina Nielsen and the No. 45 Audi R8 LMS GT4 also showed a strong opening stint, starting ninth and working up to seventh to maintain position. Erin Vogel jumped in for the car’s third stint, consistently putting down fast laps to maintain position as dusk settled over the track. Aurora Straus and Ashton Harrison raced clean through the night, keeping the Audi in seventh until a debris puncture in Harrison’s stint forced the racer to expertly nurse the car back to pit lane. With a fresh set of tires, Nielsen took over and fought her way back up to sixth from tenth. The ladies cycled through, they maintained sixth position until 11:00PM, when Straus reclaimed fifth overall, first in class. For the next five hours, the ladies continued to put in steady runs and impressive lap times, with a five lap gap to fourth and a 19 lap lead over sixth. With a comfortable gap to the next positions, the ladies pressed on to the checker flag, expertly maneuvering through a challenging field of traffic. While only one of the five had previously raced at the 25 Hours of Thunderhill, the all-female team ran a near-perfect race, placing as the highest of three all-female efforts in the race. The Audi R8 LMS GT4 finished in fourth place overall, just seven laps away from the overall podium. The two Flying Lizard cars crossed the finish line side by side after 25 grueling hours, each celebrating their own class victories at the 25 Hours of Thunderhill. Following the checker flag, the team commended the crew for their speedy work replacing each axle on the No. 74 Porsche. The first repair took 30 minutes, and the second took 23, saving the team seven minutes. It was those seven precious minutes that the No. 74 Porsche held over the second place car as it drove to victory at the 25 Hours of Thunderhill, making the Lizards the most successful team at the longest endurance event in North America. Johannes van Overbeek also stands as the winningest driver in the overall category, with sixth to his name. 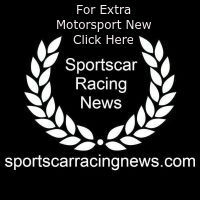 With the final race of the year complete, Flying Lizard Motorsports will now focus on the 2019 customer racing program, which will be announced at a later date. Awesome job by flying lizard as usual. We had two broken axles and spent roughly 50 minutes behind the wall collectively. But they didn’t give up and they worked great. It was great driving with Wolf, Justin, Andy and Charlie. I feel honored to be a part of the program and excited to have my sixth overall win and my seventh at the 25 hour. Thanks to Toyo Tires for providing the traction and reliability we needed to get the job done. This is exactly what I hopped the outcome would be. I love coming to Thunderhill. I love this race track and I learned to race here a long time ago in another life. It’s nice to come back with a good friend like Johannes, a great team like Flying Lizard and meet some new friends. It’s a grueling race. Some elements I expected, some were surprises. There were so many different cars and classes and managing traffic was a challenge. I’m happy to get a win. It’s a special event and I’m glad to be a part of it. The 25 Hours of Thunderhill us such a fun event to do, especially with a team like Flying Lizard and with the support of Toyo Tires. The Lizards executed perfectly and took care of every possible need we drivers could have. The crew repaired our broken axles so quickly, and were able to keep us competitive throughout the race. Toyo again gave us great tires and incredible support to be there to fight every single stint. The tires performed well all weekend long in every type of weather condition. It’s great to have their support for this event. This is my second win in a row here at the 25 Hours of Thunderhill. This race felt longer than 25 hours, that’s for sure. Our mechanical issue in the first 30 minutes really put a damper on the start for the crew, wondering if the other side would last and how the rest of the car would perform. We really stretched the car’s life throughout the race and it lasted fine. It was an exciting race, and really good at the end. I’m happy we were able to be here at the end with Toyo Tires and Flying Lizard. We had some technical difficulties in the beginning with two of our axles. We made it back up to P3, after fighting hard to make it back up to the top cars. It was a great race. It’s great to be here. My co drivers did a good job. We had no contact, which is very impressive in such a race with so many cars. We did a good job and the team did a good job. The pit stops were great, and everything went very well. I’m proud I was back here with Flying Lizard. This was the most incredible experience of my live. Flying Lizard’s professionalism and skill was so impressive. Their level of execution is just mind boggling. To have the women drivers I had with me was a wonderful experience, and to get so close to the overall podium was a dream. It would have been cool to be on the podium, but to get that close is something I really hoped for. Fourth overall is pretty good. I had a great time at my first 25 Hour event. This was my first endurance event and first time night racing, so there were a lot of firsts for me. I can’t thank Erin enough for inviting me and to Darren Law, Brad Roberts, and the entire Flying Lizard team. Nothing could have been better than this. It was a great first experience and I’m hoping to do more now. Today, Flying Lizard, Toyo Tires, Jester and Babbitt, and my amazing teammates and I made history as an all-female team to win (and finish 4th overall) at Thunderhill. This entire race has been a dream come true thanks to the hardworking pros at FLM and my co-drivers. I am in awe of the 36-hour work day that Jim, Thomas, Darren, and dozens of other team members at FLM have endured to get us to the top step of the podium, and I’m so grateful for their help in getting our R8 up to speed immediately. I am especially grateful to Erin, Laura, Christina, Ashton, and the 10 other women out on track. Women can, and will, compete against men, and our result today reflects that. I’ve never been prouder to be a part of a team effort than I was today! Wrapping up this weekend, it was absolutely incredible. It obviously could have gone better by winning first overall, but we made history on all aspects; first in class, and first all-female team to secure pole, and to finish fourth overall was just badass. The drivers were incredible and we didn’t have a real problem the entire race. We had two tires go down, but stayed on the lead lap, we kept it going. Erin Vogel’s family is top notch and the entire team was so badass. We had a good time and I’m looking forward to doing more racing with these guys one day.